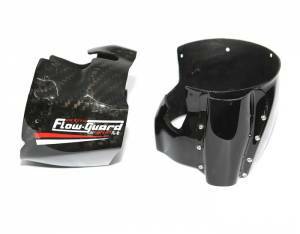 This innovative Pump Flow Guard from RRP/Ninja helps to increase performance and to gain more height for aerial maneuvers. It allows for full functionality of the steering nozzle and trim system. Prevents the water flow from the outside of the pump entering between the restriction and steering nozzles, breaking the flow water inside the pump. Prevents back spray when turning the steering nozzle, and loss of internal pump pressure. Stops the pumps spraying into the exhaust, which causes engine bog on acceleration during turns and maneuvers.